Pay securely by Paypal Business; no registration required, simply click 'Don't have Paypal account'. The latest in our popular series starts on a beautiful January day, with 45690 Leander working out-and-back over Shap due to the on-going closure of the Settle & Carlisle line north of Appleby. 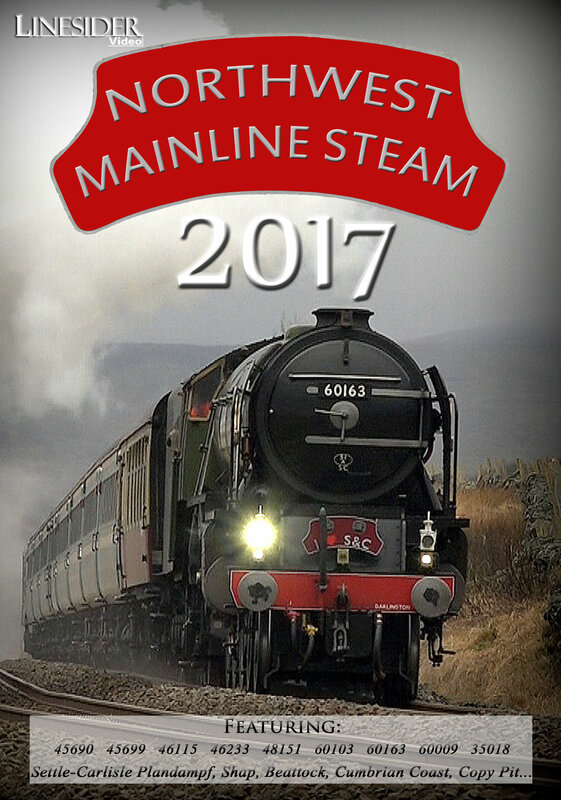 Ahead of the re-opening special at the end of March with 60103 Flying Scotsman, we extensively feature 60163 Tornado working the 'Plandampf' service-trains in mid-February between Skipton and Appleby. We also extensively feature Scots Guardsman's work prior to withdrawal in August for major overhaul, on the Settle & Carlisle, Shap, Beattock and the Cumbrian Coast route. Other highlights include the return of 35018 British India Line, alongside memorable performances from the Duchess, Galatea, Leander and 48151. We also had time to capture 60009 Union of South Africa on test around the Carnforth Circle, following repairs. All in all, a great year - and at over 3 hours long - best served in chunks! Locations: Claughton, Garstang & Catterall, the Lune Gorge (from on high), Scout Green, Low Hurst (2), and the Lune Gorge. Locations: Shap Summit, Workington, Braystones, Eskmeals Viaduct, Dalton Tunnel. Morning, northbound: Selside, Lodge Hall, Blea Moor, Rise Hill Tunnel, Shotlock Tunnel, Ais Gill. Afternoon, southbound: Smardale viaduct, Kirkby Stephen, Bullgill, Birkett Tunnel, Pendragon Castle, Ais Gill. Afternoon, northbound: Langcliffe, Horton, Ribblehead, Blea Moor, Dent, Garsdale. Locations: Dillicar, Scout Green, Leaving Carlisle, Dalston, Arnside, Middlebarrow. Locations: Hampson Green, Galgate, Scout Green, Shap Wells, Nr. Greskine (2), Leaving Beattock Summit, Elvanfoot. Locations: Lowgill, Lune Gorge, Leaving Carlisle, Approaching Dalston (2), Arnside. Locations: Oakworth (KWVR), Gargrave (2), Selside, Rise Hill, EdenBrows (2), Kirkby Stephen, Bullgill, Keighley (including a shot of WD 90733 leaving with the last leg of the journey on the KWVR). Locations: Approaching Clapham, Billington, Pleasington, Brock. Locations: Selside (2), How Mill, Naworth. Locations: Crawford, Elvanfoot, Gretna Green, Low Hurst, Wreay, Approaching Shap (2) + 45690 Galatea the following day at Sliverdale. Locations: Bentham, Long Preston, Wennington, Bentham, Long Preston, Hellifield, Giggleswick Bank (3). Locations: Bentham, Langho, Barton & Broughton Loop, Barton. Locations: Selside, Ribblehead-Blea Moor, Garsdale, Waitby Cutting, Birkett Common, Mallerstang, Ais Gill, Shotlock Tunnel. Locations: Chatburn, Swanside Viaduct, Selside Shaw, Lodge Hall, Ribblehead Station, Yanwath, Harrison's Siding, Shap Summit, Lancaster, Brock, Barton. Locations: Shap Summit, Howe & Co. Sidings, Ais Gill Viaduct. Locations: Stirk House, Gisburn Tunnel, Helwith Bridge, Helwith-Horton, Stockber, Crosby Garrett, Whalley Arches, Langho, Hoghton Tower. Locations: Eden Brows, Angerholme, Ais Gill Summit, Ramsgreave and Wilpshire, Wilpshire Summit, Garstang and Catterall. Locations: Borrowbridge Viaduct, Tebay, Pleasington, Chatburn, Settle, Horton, Selside, Shotlock Tunnel, White Birch, Ais Gill, Smardale, Greengate, Pendragon Castle, Mallerstang, Hazel Gill, Shoregill (2), Angerholme-Ais Gill, Ais Gill Summit (2), Garsdale (panoramic), Blea Moor Tunnel, Wilpshire Tunnel, Pleasington, Scorton, Bay Horse, Melling Viaduct (light engine), returning to Carnforth 10A (light engine). Locations: Scout Green, Shap Summit, Pendragon Castle, Ais Gill Summit. Locations: Mewith, Approaching Clapham (slipping to a stand and recovering following hand-sanding), Kettlesbeck, Hellifield. Locations: Scout Green, App. Shap Summit, Dalston (2). Locations: Returning with 13 on, Gargrave (2), Giggleswick, Giggleswick Summit. Locations: Stainforth, Horton, Wetheral Shield, Howe & Co. Locations: Holme Chapel, Copy Pit Summit (from on high), Kitson Wood Tunnel, Bamber Bridge, Barton, Garstang and Catterall (at speed! ).